Stuart Falls – Crater Lake National Park - Explore! Stuart Falls – Crater Lake National Park - Explore! Let’s start this story with a confession . 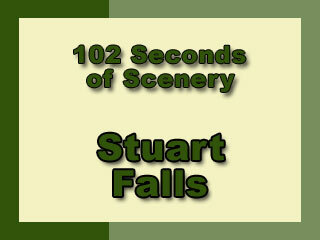 . . Stuart Falls is not in Crater Lake National Park. It’s actually in the Sky Lakes Wilderness on the Rogue River National Forest. The title, however, highlights Crater Lake National Park because the journey is mostly within the park. 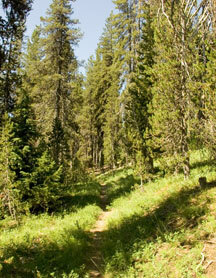 It starts at the Lodgepole Picnic Area that also serves as trailhead parking for the Pumice Flat Trail. The picnic area is on Highway 62 between the south entrance to the park and the Annie Spring Entrance Station. The trail starts on the other side of Highway 62 just south of the picnic area’s south entrance. Since the trailhead parking is outside the main park area, there is no entrance fee. If you want to camp overnight, you will need to get a free permit. Getting the permit entails a stop at park headquarters and getting to park headquarters takes you through the entrance station where you will need to pay the park entrance fee. After doing a little reconnaissance of Annie Creek Canyon, I arrived at the trailhead (N42° 50.169′ W122° 08.543′) at about 10 o’clock on a beautiful summer Monday morning for my solo journey. I strapped on my new CamelBak M.U.L.E. backpack and headed into the forest. On this side of the Cascade Crest, the forest is mostly lodgepole pine with an increasing understory of fir until it becomes entirely fir on the west side of the crest. Like most lodgepole in this region, the trees have lived their lives and are succumbing to pine beetles, leaving the forest filled with dead and down trees. The new forest is already rising from beneath the standing dead. 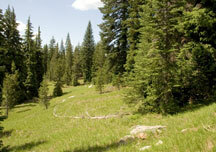 Future development of this forest depends upon whether – or when – wildfire passes through. The Park Service has done an admirable job of removing blow-down from the trail. In fact I had to step over only a handful of down trees and those were on the west side of the crest. Your experience may be different – blow down is a continuing issue here. The Pumice Flat Trail rises gradually from about 5,800 feet (1,770 meters) at the trailhead to 6,250 feet (1,900 meters) at the Pacific Crest over a distance of 2.7 miles. Some of the trail is as pictured, but much of it, particularly across Pumice Flat is wide enough for automobile traffic. It’s certainly not hard to find in the summer. There are trail markers 20 feet up the trees for those who choose to travel in the winter on snowshoes or skis – yes, the snow gets deep here! Pumice Flat itself isn’t exactly flat. It’s gently rolling country. Rain and erosion continue to flatten the area because the pumice soil and rock actually float on water, eventually settling into a flat plain. Due to the dense forest, views from the trail are limited to a few glimpses of Bear Bluff to the north. Observable wildlife is sparse. I saw gray squirrels and chipmunks, evidence of deer and a few birds (robins, flickers, juncos, flycatchers, and one hummingbird). Upon reaching the Pacific Crest Trail I discovered that the Park Service has made some changes. The Stuart Falls Trail once was a continuation of the Pumice Flat Trail to the west of the crest. Now, the Stuart Falls trailhead has been moved about an eighth of a mile north. It’s actually a nice change because there are great views of a beautiful mountain meadow just to the west of the Pacific Crest Trail and south of the new section of the Stuart Falls Trail. From the crest its around three miles to Stuart Falls. The change in forest is striking. Here we enter the cooler, damper fir forest. For the most part the trail is among the trees, but there are several great viewpoints looking south. The photo below shows one of those views with Goose Nest to the left (east) at 7249 feet (2,209 meters) and Goose Egg to the right (west) at 7,124 feet (2,171 meters). These peaks are about three and four miles away, respectively. The trail winds around through the forest and over the rocks on a downward slope notably steeper than the Pumice Flat Trail. If there is wind through the trees, you may not hear the waterfall, since it is a little way off the trail. There is, however, a big blue arrow pointing the way and you may catch a glimpse of the falls below the main trail. There is a nice open space just below the falls so you can get some great views. People have been camping here although the Forest Service is discouraging that in an attempt to rehabilitate the area with natural vegetation. Most of the time the falls will be dappled with shade, but I arrived at one o’clock, after three hours exploring the trail, to find it in full light. The prize is, of course, the falls (N42° 47.941′ W122° 12.778′): After eating lunch, taking some photos, shooting some video and just resting, I donned the CamelBak and left the falls around 2 o’clock. I headed back to the Pacific Crest, Pumice Flat Trail, and the pickup. I had just noticed some dark clouds moving over the canyon at the base of the falls as I headed up the trail. The sounds of the waterfall were soon replaced with thunder as an unpredicted, but typical, thunderstorm moved over my path. The fir canopy provided reasonable protection from rain and small hail as I continued on. The danger in a forest from a lightening storm isn’t so much the lightening as it is the wind. Unlike a golf course, there are plenty of tall trees around to draw lightening away from a person. Wind, on the other hand, can blow over those trees – a potentially deadly possibility. Fortunately the wind was minimal and I walked out from under the storm in a mile or so. The rest of the journey was uneventful and I arrived back at the pickup at 5:30 after seven-and-a-half hours of exploration. This adventure rates highly in the category of scenery because of the waterfall itself and the expansive views at various points along the trail. The sense of adventure is there as well. There is no quick escape from a thunder shower and evidence of humanity, beyond the trail and a few signs, is non-existent. I saw no one during this adventure – the solitude is great! The variety in the experience is good too. 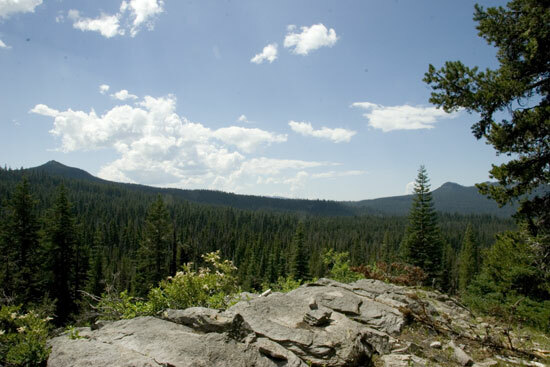 Eastside lodgepole and westside fir and their associated plants provide two distinct ecosystems and the combination of rock and water within the ecosystems only adds to the variety. History rates low. 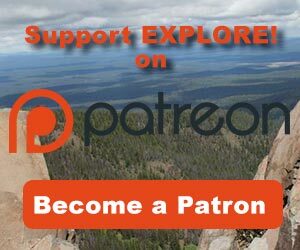 There is the history of Crater Lake National Park and the Pacific Crest Trail all around, but nothing is interpreted for the explorer. The journey offers some interest to kids that will enjoy messing around at the falls and trying to swim in the freezing water at its base. Overall, I gave this adventure a rating of 5.4. 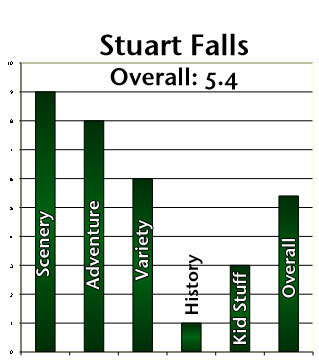 If you’ve been to Stuart Falls and have another opinion, please add your comments below. I went both directions on the Pumice Flat Trail, PCT and Stuart Falls Trail. Going in from the Lodgepole Picnic Area trailhead, you follow the Pumice Flat Trail SW to the PCT, north a short distance on the PCT then SW to the falls. Of course, reverse that coming back out. You could go SW from the falls to Lucky Meadow then SE back to the PCT then north to Pumice Flat. That would add something like 4 or 5 miles to the trip. Hello, Thanks for the great post! Did you hike out the same way you came in? Or did you head south from the falls and connect with the PCT and then the Pumice Flats Trail? Trying to get an estimate of distance/time. Thanks so much! Thanks for the info. Perhaps we’ll get into further exploration of the Rogue River Country next summer. I have the Abbott Butte to Zimmerman Burn book. 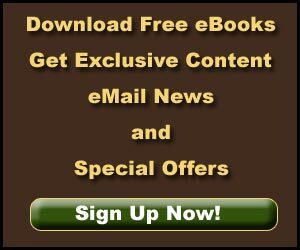 For others that are interested, they can click the link for a free PDF download. What a great site you’ve got here. I’m sure it will be a great success. I just wanted to add a comment about an alternative route to Stuart Falls via Red Blanket Trail for those looking for access from the west. 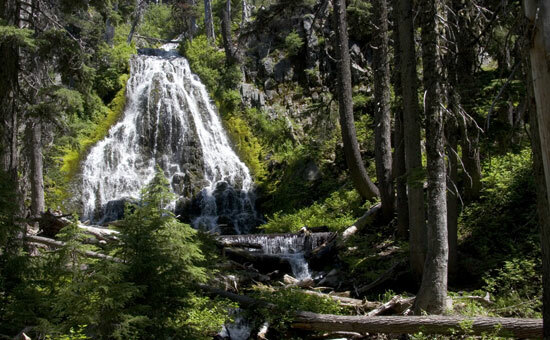 This trail climbs up Red Blanket Canyon from which several impressive waterfalls can be seen. Most memorably, a 100’+ waterfall across the canyon about 2.5 miles up from the trailhead and another 30’waterfall at the junction with Lucky Camp Trail. From this junction it’s only about another mile up to Stuart Falls. Also, in regards to the area’s history, the Rogue River-Siskiyou NF put out the following booklet: “From Abbott Butte to Zimmerman Burn: A Place-Name History and Gazetteer of the Rogue River NF.” This booklet suggests Stuart Falls may have been named after a Park Service or Forest Service employee, or possibly after an early-day hunter/sheepherder of Scottish ancestry, as the vicinity was once and important sheep-grazing ground. For those wishing to extend their hike into and over-nighter, there is also an old sheepherder/cattlemen’s shelter about two miles south near Solace Meadow. One last note for safety: In 2008 the 20,000+ acre Middle Fork Fire burned into parts of this area. Burned cat-faced trees have been and will continue to fall for years to come. You may want to remind people of this real risk. Additionally, major was outs have occurred on the Red Blanket Trail taking out sections in places as a result of the fire. Users with horses should take caution and call the Prospect/Butte Falls Ranger Station for current trail conditions. *** Also Jerry, if interested, I can probably track down a copy of the FS booklet for you.